Updated: Prelude to Season X: Quality of Life Improvements , Foundry & Iconian Reputation. Busy news day at Star Trek Online. This post has been updated too many times to count. I deeply apologize for not having updated our communication on this matter, but this is working as intended as it is currently on Holodeck. It was determined very late in our testing that keeping these items BoA instead of BoC represented a significant risk for our overall reward structure, and might encourage aberrant behavior among players (Level multiple DRs to 50 utilizing potential XP Loopholes/Exploits, just to pass off the Upgrade Kits). Because of this risk, we decided to change them to Bind-to-character-on-Pickup. Again, we should have updated our communication on this when the change was made, and we apologize for the miscommunication. We’ll see about getting the Q&A updated, and the linked Dev Post will be edited to include a link back to THIS post. To be honest I really don’t think this is a huge issue. While I created 3 Delta Recruits, I personally had no intention of levelling all 3 just for the upgrades. The Delta Vanguard upgrade was a nice-to-have. What stands out though is that there were clearly a number of players who intended to do just that. With Tribble slowly ramping up to a preview release of Season X, we’re starting to see some of the QOL changes being added for the next release. In addition to a new Iconian Reputation system (more on that in a second), many of us were stunned – nay – SHOCKED to see that suggestions many of us made months ago are being finally being added. All Mark and Elite Mark conversion projects now only take 5 seconds to complete instead of 15 seconds. This is huge, especially when people are trying – and failing – to get the elite Marks from some missions. If you’re not familiar with the term ‘Elite’ marks – these are the Borg Neural Processors, Ancient Power Cells, Isomorphic Injections, and Voth Cybernetic Implants needs to purchase rep gear. 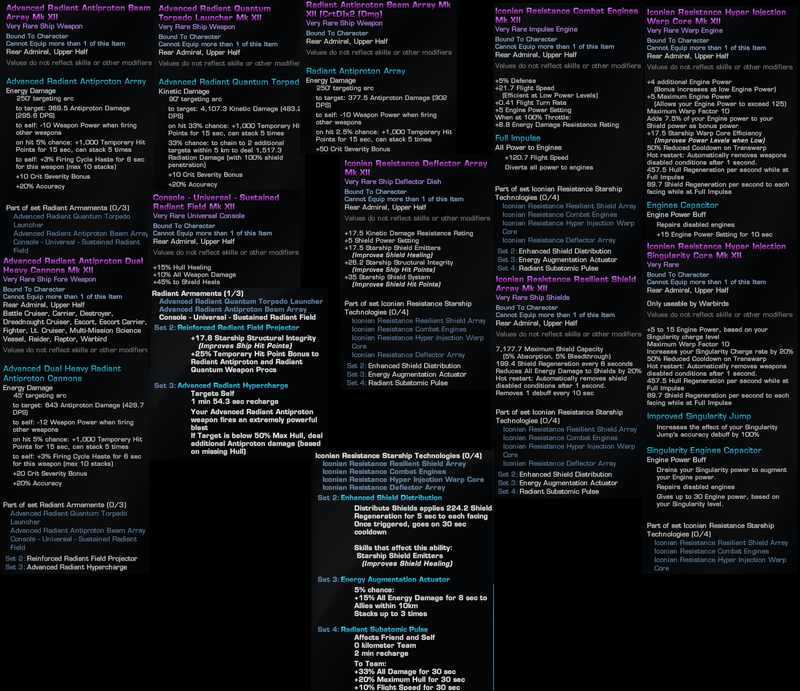 Added higher-denomination Mark-to-Dilithium conversion projects to all reputations OMGWTFBBQ this is something we’ve been begging for since the launch of LoR. This is the kind of simple, quality of life adjustment (#3 on my list) for the long-term player that stands out as being a no-brainer. Each of these higher-input projects will only appear in the player’s list if the player has at least enough Marks to complete them. Thank you, thank you, thank you, thank you Cryptic. THIS was an excellent move on your part. I can’t wait to process my mountain of unresolved issues, I mean marks. Added Ground Scale Ship models for use in the ESD Docking Bay and other maps. Added a number of Space Stations. Updated the UGC Version of the Bajor Planet to use the proper material. Nope. Not OP at all. This also represents the first reputation* that benefits AP (antiproton) as the primary energy choice. With the games focus shifting from exploration and the discovery of new worlds to one where your damage output is your primary goal, maybe it’s time to start outfitting for AP on my toons. Am I being a tad passive-aggressive? *technically the original omega rep was anti-proton, but those weapons are no longer available in-game for space. I am scared about AP. Rumours have bounced around the forums that it’s broken, that it’s bonus damage effects are in essence OP, but it’s low enough on the ‘lets fix this’ list that it may never be done. Cryptic has a tendency to fix things once you’ve invested heavily in them. I’d sure love a confirmation that it’s 1.) not broken, and the 2.) they are not planning a fix before I invest hundreds of upgrades per character to get a set to XIV. Click to see the full-scale atrocity. The Iconian Resistance is an alliance comprised of forces throughout the Alpha, Beta, and Delta Quadrants. These three forces have banded together to create a unified front against the Iconians and their servitor races. Their sole purpose is to prevent the Iconians from subjugating our galaxy once more. This new reputation will become available with Season 10’s release and will feature all new traits, kit modules, space equipment sets and a ground equipment set. Increasing your standing with the Iconian Resistance will require the submission of Iconian Marks. These can be earned by completing repeatable queued events featuring Iconian Heralds, such as: Gateway to Gre’thor, Brotherhood of the Swordand The Herald Sphere. Each of these missions allow for scaling rewards, increasing the amount of Iconian Marks received if you are able to perform above expectations and/or complete bonus objectives. Iconian Probe Datacores can also be earned by participating in the Advanced and Elite versions of any queued event which rewards Iconian Marks. Iconian Probe Datacores recovered from the wreckage of Iconian Probes have revealed a great deal about the strengths and weaknesses of the Iconians and their Heralds. High-end gear projects will require a small amount of Iconian Probe Datacores in order to claim the best equipment that the Iconian Resistance has to offer. They may also be submitted to the Iconian Resistance in return for Dilithium Ore. This Warp Core incorporates appropriated Iconian technology, regenerating Hull and Shields when traveling at Full Impulse and significantly reducing Transwarp recharge times. NOTE: This Warp Core cannot be equipped on Romulan Warbirds. Singularity Core: This Singularity Core incorporates appropriated Iconian technology, regenerating Hull and Shields when traveling at Full Impulse and significantly reducing Transwarp recharge times. NOTE: This Warp Core can only be equipped on Romulan Warbirds. Receive a shield healing over time effect after using Distribute Shields. This bonus shield heal effect can be triggered once every 30 seconds. When using energy weapons you have a small chance to boost your team’s energy damage by a small amount for a short time. When activated, this ability provides a modest boost to damage, maximum hull hit points, and flight speed for your entire team for 30 seconds. Beam Array – Advanced Radiant Antiproton Beam Arrays have a high innate Critical Severity, as well as a chance to provide a small amount of Temporary Hit Points. Additionally, they continually reduce their recharge rates the more they are fired. Dual Heavy Cannon – Advanced Radiant Antiproton Dual Heavy Cannons have a high innate Critical Severity, as well as a chance to provide a small amount of Temporary Hit Points. Additionally, they continually reduce their recharge rates the more they are fired. Your Advanced Radiant Antiproton weapon fires an extremely powerful blast that deals additional damage if the target is below 50% hull. This bonus damage increases as the target’s health decreases. The Iconian Resistance Personal Shield is an advanced form of protective energy screen technology. 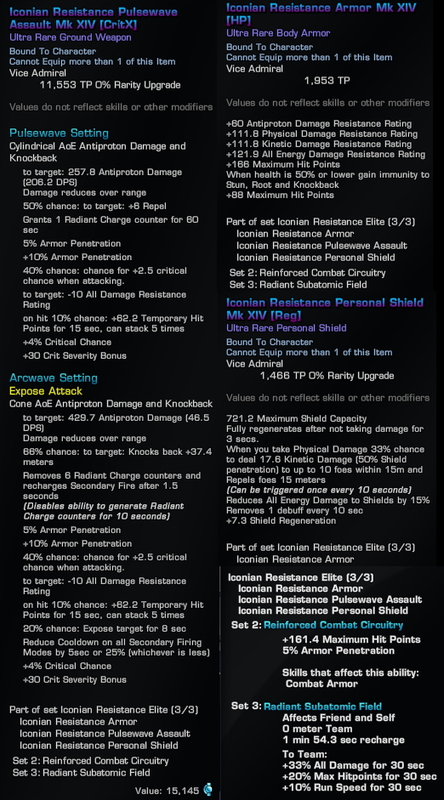 It offers a high shield capacity and enhanced resistances to better withstand Herald assaults. This shield will periodically engage emergency decontamination protocols to remove debuffs. Should the wearer be struck by Physical damage, there is a chance a pulse of force will blast enemies away and cause a minor amount of kinetic damage. The Iconian Resistance Pulsewave Assault fires bursts of Radiant Antiproton energy, and is capable of building up Radiant Charges with its primary fire mode. Once enough charges are built up, the secondary fire is capable of consuming charges to cause the secondary fire mode to recharge very quickly. Activating this ability provides a modest boost to your team’s damage, maximum hit points, and run speed for 30 seconds. In addition to these equipment sets, advancing through the tiers of the Iconian Resistance Reputation will unlock access to a large array of Radiant Antiproton energy weapons, and Radiant Quantum Torpedoes. Three unique Kit Modules will also be included in the Reputation. Each is restricted to a single Profession. Provides a boost to your critical severity and causes your weapon attacks to deal additional damage as shield penetrating radiation damage. Creates a Photonic Barrier that applies a moderate amount of Temporary Hit Points every few seconds and provides a modest boost to your damage resistance. Cone AoE attack that deals radiation damage, reduces perception and damage to affected targets. No reputation would be complete without a new suite of ground and space traits. Receive a portion of your outgoing damage as healing to you. Receive a portion of your outgoing damage as hull healing to you. Chance on weapon attacks to cause a moderate amount of radiation damage in an AoE and remove buffs from affected targets. When damaged, gain Immunity to all damage for a short time. May occur once every 60 seconds. Chance on energy weapon attacks to cause a moderate amount of radiation damage in an AoE and remove buffs from affected targets. Creates a platform that taunts nearby enemies and debuffs enemies that attack any target other than itself. One one hand, I’m not convinced that the Iconian reputation sets (all of them) are really all that amazing. Or at least, I’m not wowed by them. I like my antiproton [CrtD]x3[over] beam arrays – the occasional overload feels pretty satisfying – and usually reputation weaponry don’t climb as high in regard of item quality. I also have plenty of sources for temporary HP already; so investing further feels like overkill. As for the ship equipment set, there’s this odd slant on “fly as fast as possible” which actually is not all that convenient – it feels very “Pedal to the Metal” trait… and I don’t use that trait because I hate being shoehorned in constantly keeping my throttle up. I’m a bit more in favor of the ground set. The stats don’t wow me either and I’m not a shotgun user, but in the eyes of my rep-less delta recruit, it might be viable. I haven’t decided. MACO is still kind of the “good for all sauces” set in my eyes. I’m also cautiously optimistic about the appearances the Iconian set has; with good textures (diffuse, bump, specular) it could end up looking nicer than a still gives justice. tl;dr: I don’t see the OP, I’m only mildly interested. Perhaps Season 10 content or user reviews of those set in use will change my mind. I’m in the same boat when looking at ground sets. While many of the newer reps have value in certain situations, MACO is still a favorite. Given the upgrade costs I’m less likely to have 1 set of everything for each alt. But yeah – going to take a hard look at the new ground set.